I wanted to thank you for the wonderful cooking class! That was one of our highlights of the trip- Rick and I enjoyed ourselves immensely! Marianne's food was incredible and it was such a nice group of people to cook with! We can't wait to try the recipes at home. Please let me know if there are any good photos of that night! I also recommended your tours to my girlfriend who is a travel agent. Now that I've settled back, unpacked etc, I would just like to add a few words of gratitude to you Tania, for the welcoming hospitality you have given both to Alex and myself during our exquisite vacation In Tropea. I have always been aware of what Italians have to offer both in the culinary and fashion industry but you have managed to execute the Italian cuisine and way of life in Calabria in a way I believe no other can. I applaud you for your mannerism in the way you translated the language for us to understand step by step (already I have put into practice some of the dishes we made together). We shared wonderful humour together and in all honesty haven't laughed so much. Jenni and Noel were wonderful company couldn't have asked for a better couple to accompany us on this wonderful experience. You will definitely see me again and I look forward to more memorable times together. Hi Tania! Greetings from the Rocky Mountains! Meeting and getting to know you was one of the highlights of my three weeks in Calabria! 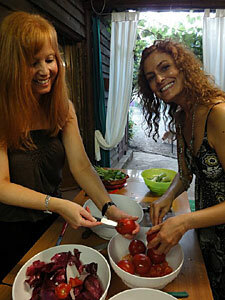 The visit and cooking class with Marianna could not have been sweeter or more fun, and the food was fabulous! All the best with everything !!! Ciao ciao! Hope you are doing well! Scott and I are back in California and just wanted to say thank you again to you, Franco & Marianna. We had such an amazing time and it was the highlight of our honeymoon. We even went to the store you guys suggested and bought cheese graters like Marianna's. Please let Franco know we successfully brought the seeds back and can't wait to plant them. When you have a moment could you give us the ratio's / recipe for the limoncello and black licorice aperitivos? Take care - I hope we get to come back to magical Tropea soon!!!! Wayne and I are back at home in the US and Donna and John are headed to Germany and will return in about a week! We just wanted to let you know how much we enjoyed our cooking lessons with you, Marianna, and Franco! Now that I am home, I am hopeful to at least "attempt" some of those wonderful recipes! Tropea is a wonderful place made all the more beautiful by people like you . We had a lovely time; the people you selected to help us were wonderful and we saw lots, ate wonderful meals and learned a huge amount in 2 short days. 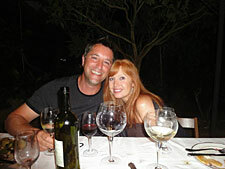 We absolutely loved Italy and can't wait to get back (maybe a villa in Tuscany and wine/cooking classes next time)? We will be recommending you to our friends and calling you when we are ready to head back to your beautiful country. Thank you once again for the most amazing day! It is a day I will never forget! Im still so excited about it! The hotel I am staying at is up one of the mountains and it is quite a steep hike but the view is amazing! Am currently sitting watching the sun set over the water and the mountains. I must tell you that never in our life have Mike and I felt so fortunate to be involved in an experience as the one you put together for us. Every moment of every day was special and thoughtful as well as educational. Tonight for dinner at our daughter's house I made the fennel salad. It was a huge hit. 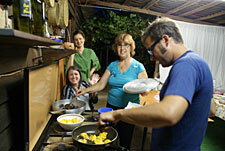 The cooking lessons were very organized and worthwhile. I learned a lot. Mike loved being involved in the activities at everyone's home or business. The people you have brought into your tours are truly an asset to what you are doing. They represent you well. Andrea was an incredible host and guide. He made us feel so welcome and we never worried about anything. He and Mike had some fantastic conversations. Again, you have chosen well in Andrea. He had the most beautiful smile every morning when we meet with him for the day. He seemed to really enjoy every moment. Your wonderful surprises were so fantastic. Thank you for treating us so well and being so thoughtful. Every person we had an opportunity to meet was an incredible experience. The cake, music and special treatment at Marianna's was a night we will never forget. 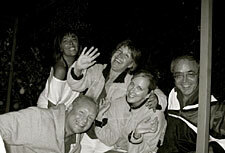 Tania, I truly enjoyed every moment we had in Tropea. I can't wait to try a few of the dishes. I just shared some with my daughter in Seattle hope to bring her there some day. Of course I have 7 children so I will have to tell them to start saving their money if they wish to go. Hope we can do that. Also the time with family was of course wonderful. They also cooked some wonderful meals. My cousins made the Lasagna just like Rosanna, I believe we are related to Rosanna I am related to the Pirillo's and the Parisi's. Linda's grandfather and mine were brothers their name was Pirillo. They were from the same area as Rosanna's. Thank You again, we had a wonderful time. Dear Tania, I'm finally getting to write to you after our amazing experience in Marianna's kitchen! 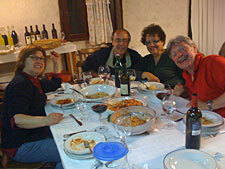 We had a lovely time learning about Italian specialities and traditions, tasting all of that fresh tasty food and wine. Marianna, Franco and Andrea were so nice and friendly. Thanks again for making time for us on that night. We keep recommending your website to everyone. I could go on forever talking about how wonderful the tour was. It is hard to consolidate my ideas into one paragraph! I highly recommend this tour to anyone who would like to visit the region of Calabria and experience its beautiful scenery, warm, generous people and delectable regional cuisine. Cherrye, Tania and Andrea went above and beyond to make sure our small group experienced as much as they could possibly squeeze in to one week. From Morano Calabro to Tropea we hiked, toured picturesque villages, saw cooking demonstrations, made pasta and dined on incredible food. The wine flowed freely and was wonderful. 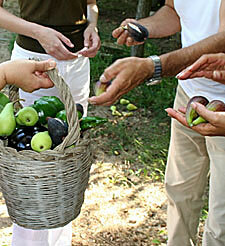 What made the tour so special was the participation of the agriturismo and restaurant owners in our daily activities. They were so passionate about showing us the history and beauty of their country and dining and dancing with us that we felt like locals instead of tourists. And our tour guides made sure that we had everything we needed during the tour. 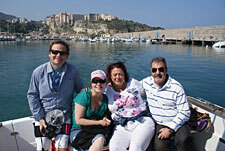 We experienced "la bella vita" of Calabria and will most definitely return! I hope you are doing well! We all had a marvelous time with you while we were in Italy - Nana hasn't stopped talking about it! Thank you again for everything! 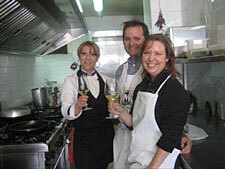 Tania, what a fantastic 9 days we spent with you and your wonderful assistants in Southern Italy. The beaches were exquisite, the food great and the accommodations splendid. For what more could a couple ask? Marianna and Franco were a special treat and the foods we assisted in preparing were absolutely stellar. What wonderful evenings sharing a little wine while learning so many special recipes? Their garden hilltop is a very special place and the memories we all shared there will never be forgotten. We have had fun at home experimenting with some of the great dishes we learned to cook. Vito was a hoot!! What a great sense of humor and an interesting command of the English language. As his Uncle Peppe, I will always be on the lookout for things he may find "interesting"! J He is always welcome to visit. 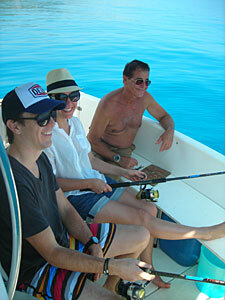 The fishing trip with Francesco was delightful. 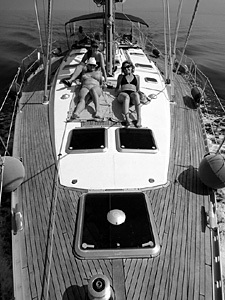 We certainly did not expect a 28 foot twin diesel with only the Captain and us on board. 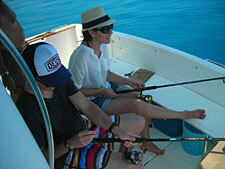 The fishing was fun but swimming off the stern was a wonderful experience neither of us is soon to forget. 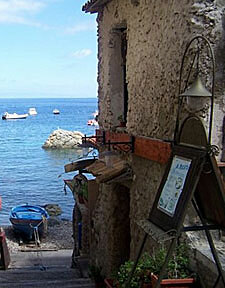 The townspeople of Tropea were very helpful and we enjoyed frequenting some of the specialty shops. On our last two nights we experienced some of the local restaurants and cuisine and thoroughly enjoyed ourselves. Truly enjoyed my time in Calabria. Thank you for all you did to make it happen. Truly a great experience. 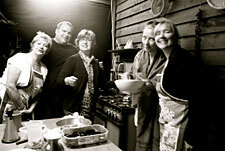 Marianna & Franco really are super people & being able to cook at the retreat really adds to your learning experience. I felt like I was a member of their extended family. Food & wine was terrific. I would love to have the pasta dish I had at Co Cos again and the lasagna we had after the grape harvest. It was a long trip back and we were all exhausted. I am still not normal with my sleeping patterns. I wish I could move Italy closer to Atlanta. All of us had such a wonderful time. I have never felt more at home than with all of my new "Italian Friends". Maria is amazing and beautiful and both Vito and yourself made the trip, everything we imagined and more. Dad and Terri are doing fine back in Ohio and miss Enzo driving them around, I think they miss having a chauffeur. I have passed Edo's recipe's out and everyone is excited to try a new dish. 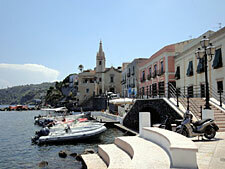 I am getting my pictures together to show my employees, many of them have been to Italy but not Southern Italy. It was so Beautiful!!! I will call you when I get some time, so take good care, I love and miss all of you. A quick note to let you know that our cooking class in Tropea was definitely the highlight of our 2 week vacation in Italia. We were charmed by the hospitality of our hosts Marianna and Franco and by the beauty of their rustic hill-top country home and al fresco kitchen. 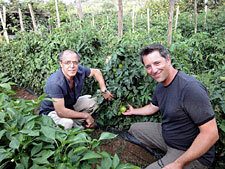 What a pleasure it was to walk through Francos garden picking fresh vegetables and herbs to cook with. The meal we prepared was a feast fit for a king. 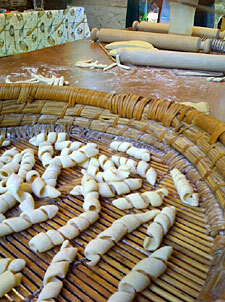 We cannot wait to try making fresh pasta in our home the way Marianna taught us. The evening was more than just great food though. 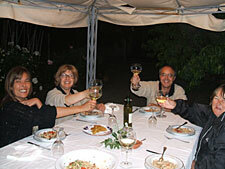 The informal setting gave us a chance to talk with our hosts and get to know more about the Italian way of life. We left feeling more like family than tourists. Tania, thank you for the wonderful experience. Your warmth and vivacity are truly refreshing. Marianna and Franco gave us the experience of our lives. They went over and above what we expected. The class in their garden in the hills was unbelievable. I have new friends and a new family from Italia!! The cooking course was fantastic. Great place and splendid food. Relaxing and having very nice people to be with. I had a fantastic day. Without a doubt one of the most uniquely gratifying dining experiences of my life. Nestled in the hills of San Angelo you enter a garden kitchen where everything is picked right before it's cooked or it was caught that day. 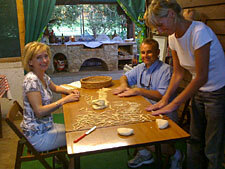 The pasta is handmade and every dish is prepared with Marianna with a big assist from her husband Franco. The feast is beyond compare. I can't say enough. From an antipasti of local cheeses and meats to black squid ink pasta to stuffed tomatoes to mussels and oh so much more you will simply eat until you break. The finest ingredients, lovingly prepared by wonderful Calabrians, you will be very happy that you decided to go with Tania and In Italy Tours. Vince and I arrived home safe and sound and are already missing Tropea... the food, wine, beach, sea... did I mention the food!!!! We absolutely loved our holiday and it was so nice to meet you! It really was such a privilege to cook with Marianna and Franco. Vince made homemade pasta last night (our first night home!) and it was bellisimo... he would have made Marianna very proud!! We are already planning our return next June so look forward to seeing you again! We'll make sure to post some pics for your website! 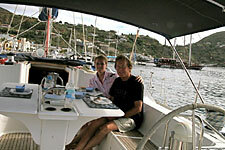 Thanks again for all of your help... the sailing and cooking class will be special memories we'll always cherish. How I long to be back in Italy, what a beautiful place and such a wonderful lifestyle - I do envy you. Thank you so much for dropping off my special rolling pin - I can't wait to use it. I have told everyone who will stand still long enough about my cooking lesson so, of course, my friends are waiting for a demonstration! Geoff and I had such a wonderful evening, Marianna and her husband are beautiful people and having you there to interpret was fantastic. Please say hello to them for us and tell them that we have come home to rain, rain and more rain and would give anything to be wandering around their garden again! Marianna is a wonderful cook and she and her husband very gracious hosts. The evening was filled with fun and laughter. I felt as if I was cooking with friends but before the night was over I was eating with family. A very memorable occasion. 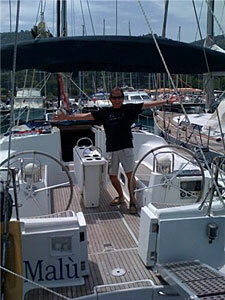 Tania found us a boat, an experienced captain, a car rental company and a fabulous hotel. She met us in Italy and set us up for our 7 day sailing trip. She took us to dinner, took us to buy groceries for the boat, and arranged for our ride to meet the boat. Then she surprised us with a gift basket of Italian delicacies, and a detailed book on the Aeolian Islands. That book proved valuable as we explored each of the islands. When we returned from our boat trip, Tania met us, again, and showered us with attention. To say she made our trip better is an understatement. Tania made the trip happen and took care of all the worry and all the details. She is dedicated, detailed and genuinely caring about her clients. Our trip was a huge success and we can't thank her enough! We highly recommend utilizing Tania for any and all vacation and cooking plans! We've laid on the white beach (no painful grey rocks here), swum in clear aqua waters, eaten clams and mussels drowned in garlic and white wine and mopped up the juices with crusty bread. We've been driven up into the hills by a fabulous ex pat from Melbourne, Tania, who runs various tours here. 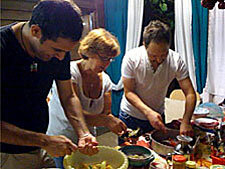 She took us for a cooking class at the home of a local, Mariana, who has a remote old uninhabited house surrounded by a beautiful vegetable garden where she runs her cooking classes in an outdoor kitchen. We were straight away given glasses of home made wine and toured round the garden. Mariana had prepared enough antipasto for ten people and then taught us to make pasta with parmigiana sauce, pork ragu, polpette, peperanata, zucchini flower fritters and so much more. Because I know people won't believe me, I took photographic evidence of Joe rolling pasta and stirring a pot of peppers. We cooked with herbs and vegetables straight from the garden, where we also saw lemon trees, chickens and enormous caged rabbits ready for the cookpot. 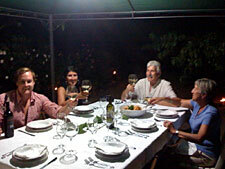 We sat down to eat the feast with Mariana, Tania and Mariana's husband Franco and the three dogs. We finished off with figs from the garden, home made cake and limoncello. Calabrian hospitality meant that we headed back to our hotel with plates piled high with cake and figs, and literally rolled into bed, groaning from over indulgence. Then we slept the sleep of the glutton - deep, dreamless, Calabrian. 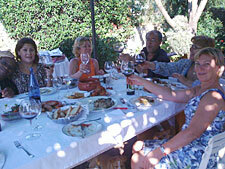 A very big thank-you for all that you did for us during our recent stay in Tropea. We know that it was difficult with the Easter holidays, but the schedule you arranged for us was perfect. Loved our time with Marianna and Franco in their very special country retreat, and the visit with Edo in the mountains was equally wonderful. The restaurant meals you arranged were all superb, and everyone involved with the program was personable, generous, and so friendly. And, of course, many thanks for your help with my lost luggage. Without you and Roberto I'd still be tracking it down! I'll forward pictures as soon as I'm able to get them downloaded. Good luck with your program----you exceeded all of our expectations, and we wish you the best! Thank you for a fabulous taste of Calabria! Your hospitality made me feel like I was visiting family. Tropea was incredible. 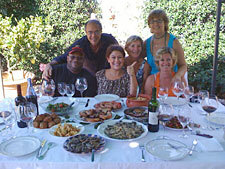 We had a lot of fun cooking with In Italy Tours. Marianna and her family were wonderful; they are such extraordinary people! The food was fantastic and we've been quite successful recreating the recipes. 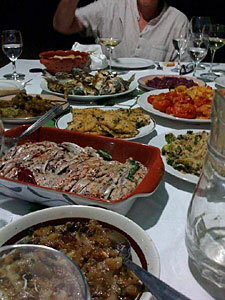 During previous trips we had taken cooking classes (yes, we are foodies!) 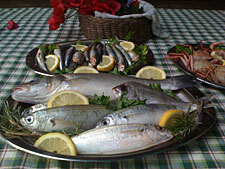 in Emilia Romagna and Northern italy, but the detail, attention and authenticity of yours can't be compared. Truly an experience!!! It made us feel as if we were part of it instead of the american tourists who think italian food is just a bowl of pasta. We have highly recommended this tour to our friends in town. They were blown away when we showed them the pictures and gave them a run down of the whole cooking experience; I'm sure they'll be booking you soon! 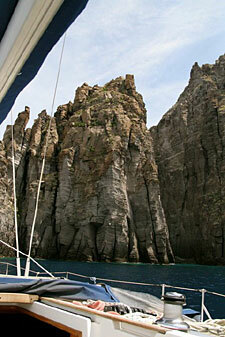 The boat trip to Capo Vaticano was unforgettable. Such a serene, and relaxing time. Heavenly! We are happy you were able to schedule it for our last day there at such little notice. Thank you so much for accommodating our needs and working around our short week. Without your help we would never have been able to rearrange things the way we did and have a few days on our own to enjoy the beach and a stroll around gorgeous, sunny Tropea. 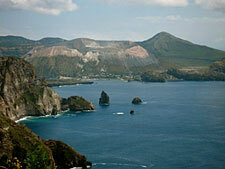 We will be back next summer to do the Aeolian Islands cruise. We are already gathering a group together. We will keep you informed of our plans. Thanks again! Thank you Tania for such a wonderful evening. 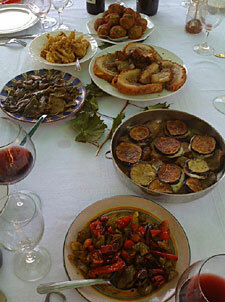 Learning to cook a local Calabrian meal was an amazing experience. Marianna and Franco were such wonderful and gracious hosts who made sure we had an unforgettable night with plenty of food and wine. 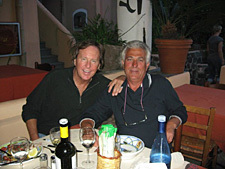 We look forward to returning to Tropea soon. 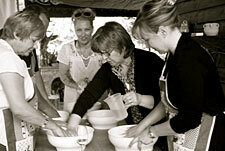 The Tropea cooking school is an Italian travel dream come true. Everything from the accommodations in a renovated 17th century palazzo set right off the main square of the magical town (complete with awesome rooftop terrace for breakfast AND computers with free internet access in every room!) to the variety of classes, to free time on the beach and strolling through town to taste the friendly locals' delicious specialties combined to make for a spectacular three days. 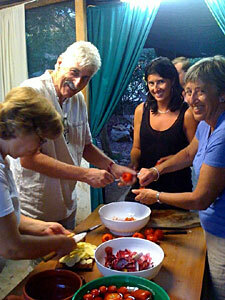 I spent one evening with Mamma Marianna teaching me the rich sauces and pastas of the region from her hilltop garden kitchen and another afternoon on chef Rosanna's seaside terrace, where she featured excellent preparations of vegetables from her organic gardens, homemade pastas, and swordfish caught that morning. It was my first time in the region of Calabria -- a wonderful introduction to inspire me to return to explore even more of what this enticing region has to offer. Thank you for everything. We had a wonderful time in Tropea. 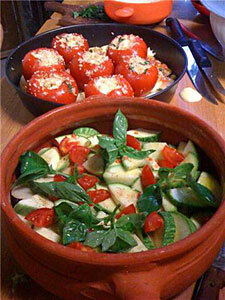 The cooking class with Marianna was definitely an experience; I loved picking the fruit & vegetables to prepare dinner. Everything was so fresh and delicious!! It doesn't compare to anything I have tried before. Working the pasta dough was fun and easy. I can still close my eyes and taste all the amazing food I had. The beaches were like no others I've seen before. The boat trip was incredible! Thank you for making everything so easy and personalized for us! It was, without a doubt, the highlight of our trip in Italy. We will be back!! I did not know what to expect when my son booked me a cooking session with 'initaly'. We were picked up from outside our hotel and driven up the most spectacular route to our destination in the mountains. On route we stopped continously at the most astounding points for us to take photographs and breath in the beautiful flowers and the sea and mountain air. On arrival we were met by our host Tania. Tania introduced my group to Marianna and Franco. 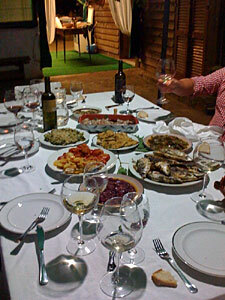 First of all we were served a number of local foods and wine. The atmosphere was' out of a novel' it was 'heaven'. The rustic farm house was surrounded by orchards and home grown vegetables and herbs. We spent time in the garden learning about the different uses of the vegetables and herbs, and collecting food for the meal. We were then treated to an interactive workshop, making our very own pasta, meatballs , fried zucchini flowers and special beans just to mention a few. After the cooking lesson and making of the food we were ushered to a beautifully arranged table, with a white linen canopy and pure white linen cloth , in contrast to the rustic surroundings it provided a chic setting for our dinner party. As the sun set we ate our fabulous food and engaged with our fabulous new friends. It is a birthday I will never forget and I will be planning my next visit with these wonderful talented people. The experience far exceeded my expectations. Thank you Tania. My Daughter and I would like to thank you for one of the most beautiful experiences while travelling in Italy. Although we assumed we would have a great dinner, we had no idea that we would be picked up by the most amazing , adorable woman who quickly whisked us away on a magical journey to the most exquisite beaches imaginable. We thought we would be driven to our cooking class but you went out of your way to show us locations no one would ever find , complete with cocktails overlooking the the most pristine sea and then we got to meet the famous Marianna!!! This lady is a secret jewel. from her country garden home where her husband, Franco gave us the garden tour as we tasted fresh strawberries, Marianna had us roll up our sleeves, and I thought I knew what Italian Cooking was all about. I obviously had no idea. The regional specialties that she had us prepare with the freshest local ingredients amazed us from the moment we arrived. All dishes were exquisitely prepared with great wine, especially Francos home made wine that he had stored away for us, and not to mention the home made liquors. 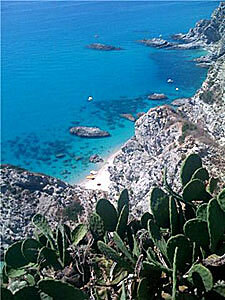 We feel so privilaged to have had this experience with you in Beautiful Tropea. 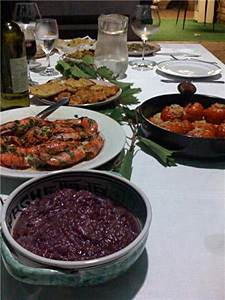 "We felt welcomed into a warm Italian family lifestyle and enjoyed making the delicious menus while tasting typical Calabrian wine. You have the best of both worlds; the bright blue sea and the exquisite views from the mountaintops. 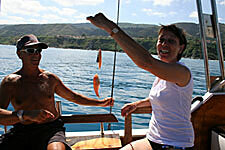 You succeeded in creating a marvelous tour with lots of variation and respect for the local products and culture. One we will never forget!" Tania We haven't stopped talking about our trip. You made sure we had a wonderful time and we enjoyed every minute of it. We can't thank you enough for your enthusiasm and your warm friendly touch. It has been a great vacation. Cooking Classes with Marianna were fantastic. I will never forget what a wonderful time i spent here in Tropea. Everyone was so wonderful and made this holiday the best thing i have done in a long time. Having Tania here making sure that everything was perfect and beautiful. You are a rare find. I'm so happy to have met you in Tropea. Best of luck in all that you do. You have made this holiday an experience I will never forget. I just wanted to send you a big Thank You for taking care of my clients. They couldn't say enough about you and your hospitality. Tropea was the best part of their entire trip! They were absolutely delighted with everything they experienced. I hope to send more clients your way. I can't thank you enough for such an unforgettable experience in Tropea. Thanks to you and you beautiful website, I would never have decided to visit such a beautiful region in Southern Italy and what a place! We have had such a great time from the minute we landed here in Tropea. The hotel was superb and cooking with Marianna was so much fun. We really felt like we were part of a family. We loved cooking in the outdoors. It was the perfect setting and the food was fantastic. 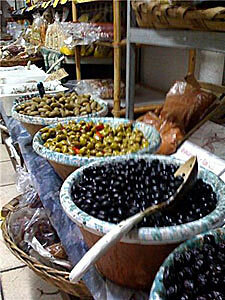 We really had the fortunate opportunity to taste the real food of the region and the beaches were beautiful. Please thank Marianna and everyone involved in making our holiday so memorable. From the moment I found this 8 day Calabria cooking tour on the net to the moment I left Bella Tropea I was continuously amazed. It is without exaggeration when I say every moment exceeded my expectations. Amazing accommodation, cooking with Rosanna, Days sailing on the Calabrian sea, Tropea city tours with Tania - everything was fantastic. Every one involved in making this tour happen were so exceptionally friendly and helpful, it honestly was an extraordinary experience. I found Tania's excursions exciting and beautiful. 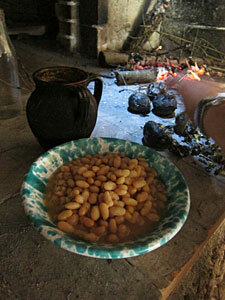 The cooking course was just the rustic setting I was hoping for. The farm with the beautiful animals was so much fun. If you are a couple or a family this is the trip for you. I look forward to doing it again someday. Thanks Tania. You are a great host! My family and I recently took a trip to Capo Vaticano. 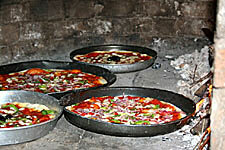 We decided to use initalytours for a cooking class and a day on the farm and dinner. This was truly an amazing experience for us. This part of Calabria is just waiting to be discovered. Our host Tania is wonderful and oversees every detail. For the true experience of the area you should consider using Initalytours.com Thank you Tania it was amazing. We can not wait to do this again!!! 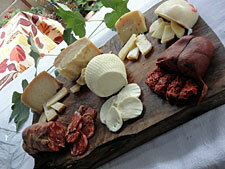 Click here to view our testimonials from the Calabrian Table Tour!